After a spate of hot, humid weather, Bob and I seized the first day of below-seasonal temperatures to go cycling in Toronto . 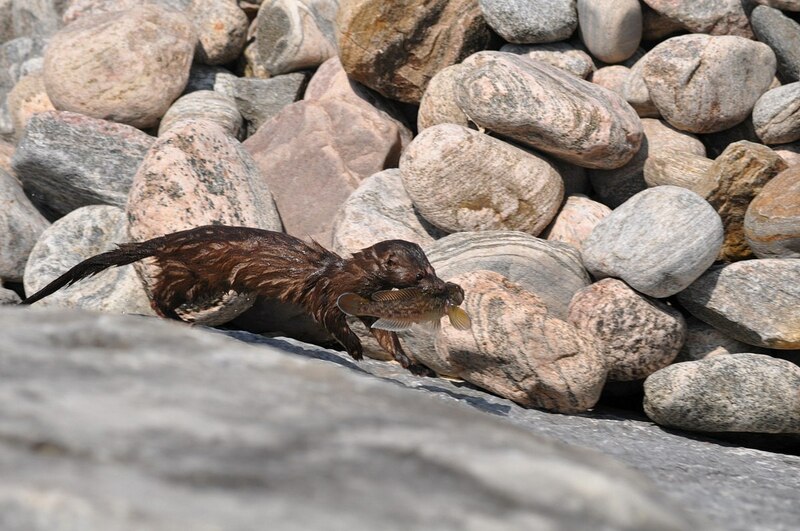 While cruising along the Lake Ontario shoreline at the bottom of Rouge National Urban Park, we spotted a Mink loping along the rocky shore with a floppy fish dangling from its mouth. 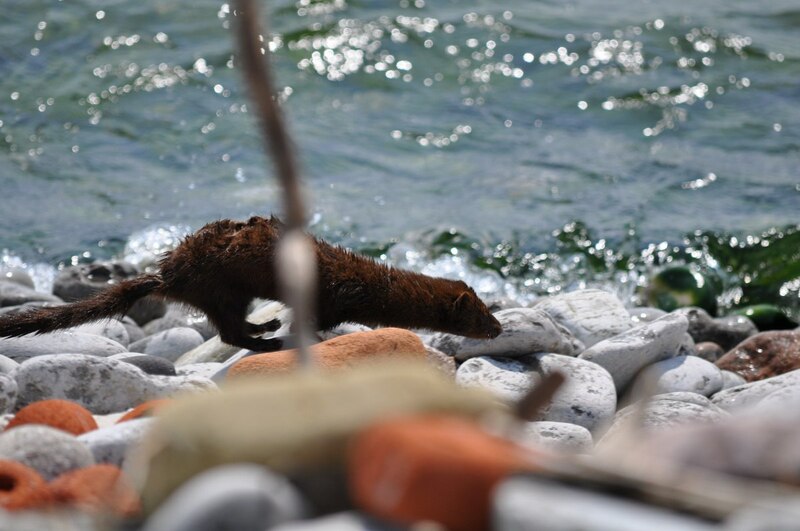 We watched as the Mink bounded along the edge of the water, by times disappearing behind rocks or under sun-bleached logs, until, in the distance, the lithe black body vanished from sight into a crevice at the base of one of the breakwaters. 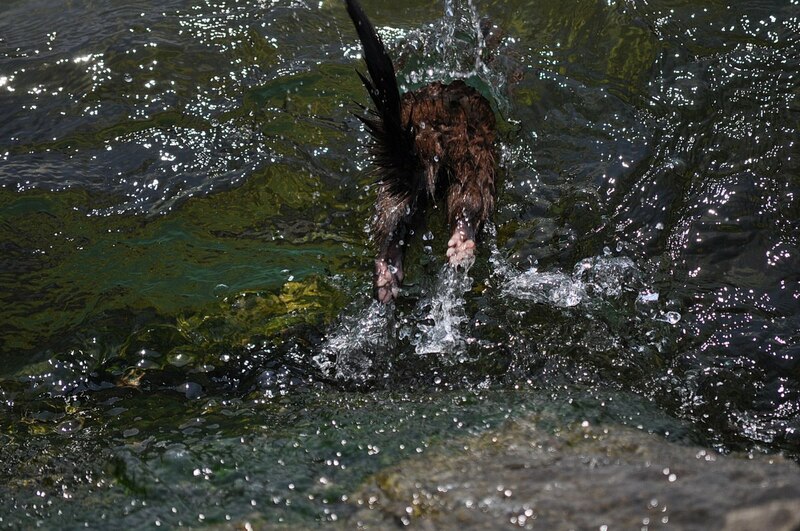 Within seconds, the Mink popped its head back out and proceeded to race back the way he had come. The Mink was not to be deterred from its mission and swiftly made its way out to the breakwater where we had first seen it. When it slipped beneath the waves, I seized the opportunity to move in for a closer look, as I hoped to see it swimming on the lakeside of the barrier. 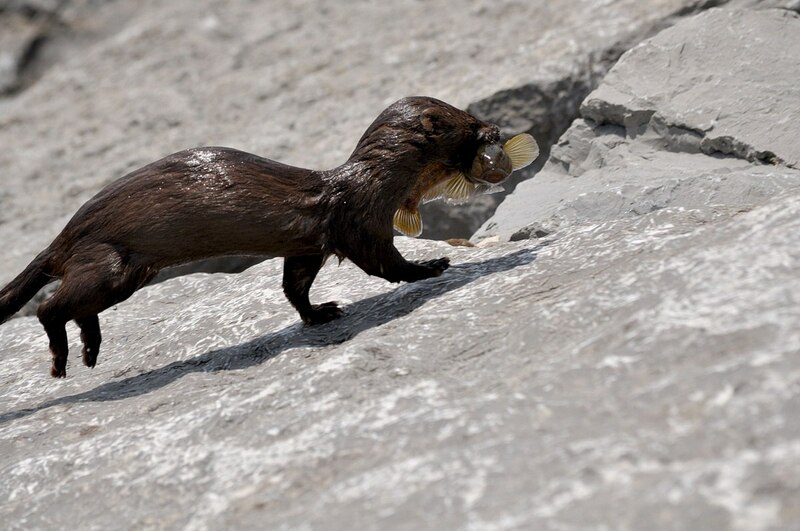 Instead, the Mink was already galloping up the smooth slanted surfaces of the massive boulders with another fish in its mouth. Our presence did not interfere with the Mink’s movements in any way. In fact, the busy little creature did not even pause to give us a glance but continued onwards following the exact same route as before. Again, in the blink of an eye, the glistening wet body of the Mink dropped out of sight into the shadows of its den. Bob and I observed, yet again, the Mink springing along in the protected shadows of driftwood debris and scattered rocks to avoid detection from would-be predators. 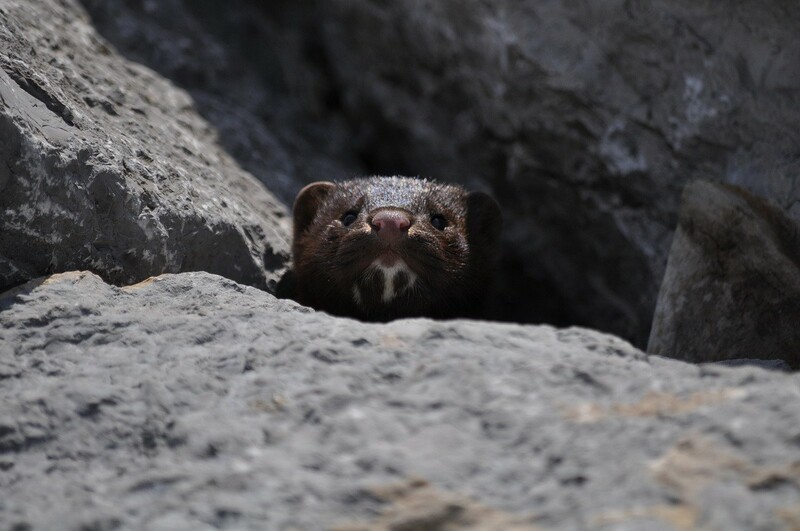 By now, we were fairly confident in assuming that the Mink had a young family to feed, and it could not risk being taken out of commission as the provider. Knowing that the Mink was so focused on the task at hand, I was able to position myself on the breaker where I might see the Mink surface with its next catch. I was thrilled to find that I managed to capture the little fella as it dove into the water head first. The angle provided an unexpected view of its furry feet right down to the bare toe tips and pads that shone pink in the late-morning sun. 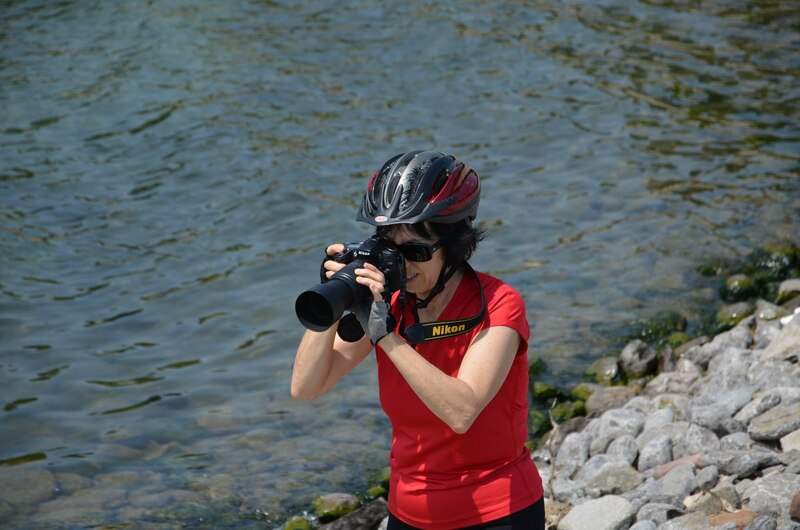 With my camera ready for action, I waited for the “fisherman” to return. 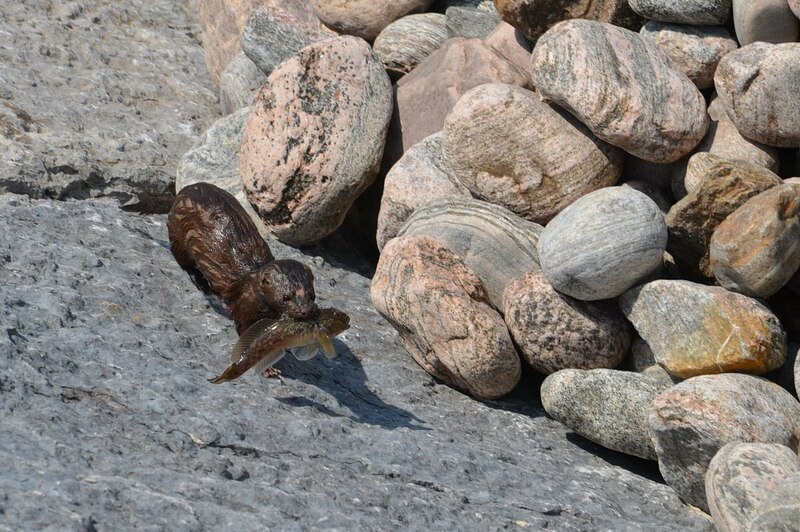 This Mink was very adept at catching fish, but I wasn’t sure how long I would have to wait. Depending on the temperature of the water, a Mink can swim for varying lengths of time. As for diving, a Mink most often dives to a depth of 30 centimetres (12 in) for about 10 seconds, but when required, it could go as deep as 3 metres (10 ft) over a span of 60 seconds. Either way, I could expect to see the Mink resurface shortly. 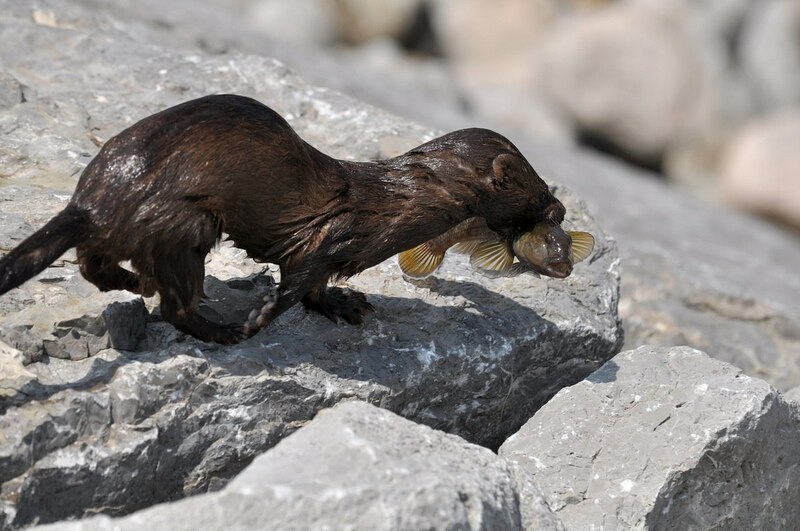 A Mink’s streamlined body shape reduces water resistance when swimming, and they routinely catch fish after a 5-20-second chase, so literally, in the blink of an eye, this Mink bobbed to the surface with a chubby Round Goby clamped between its jaws. 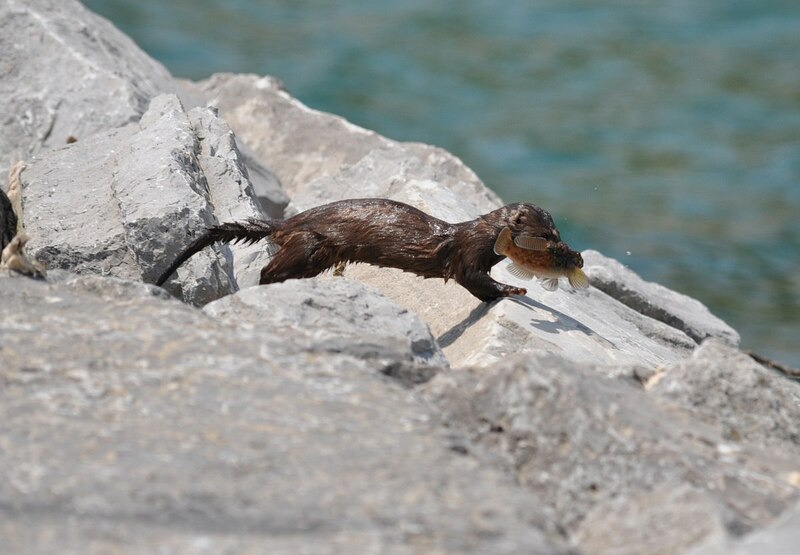 Goby’s may be an invasive species in the Great Lakes, but this Mink was sure making good use of the plentiful supply for its purposes. The Mink moved very quickly so Bob and I had to be on the ball. They use a bounding gait to achieve speeds of up to 6.5 kilometres/hour (4 mph), and let me tell you, between the two breakwaters, this Mink made tracks putting the few hundred feet behind it in a matter of a few short minutes. Given that, in our region of Ontario, Minks mate in April, the young are born in June in a litter of between three and six kits. You can see that the Mink was on the run. There must have been several hungry mouths to feed back in its lair. 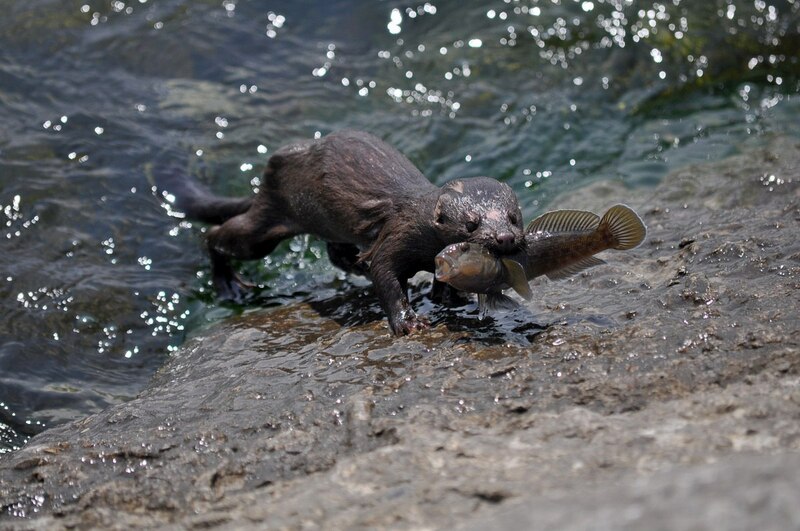 By the time the Mink deposited the Goby in the den, it may well have been still alive. The kits would be weaning soon, at five weeks of age, if they hadn’t already, and with the fresh supply of fish, they will be growing quickly. Bob remarked at how wet the fur of the Mink appeared considering it is an animal that spends a lot of time in the water. A Mink’s summer fur is not nearly as long, thick or shiny as its winter fur, but in any case, these mammals are only semi-aquatic. 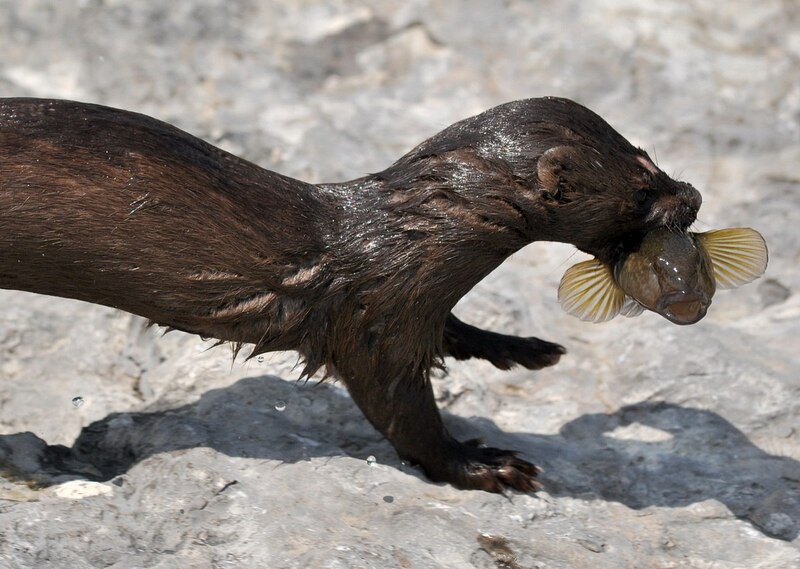 Unlike Otters, a Mink’s thick underfur and oily guard hairs only make the coat water-resistant. 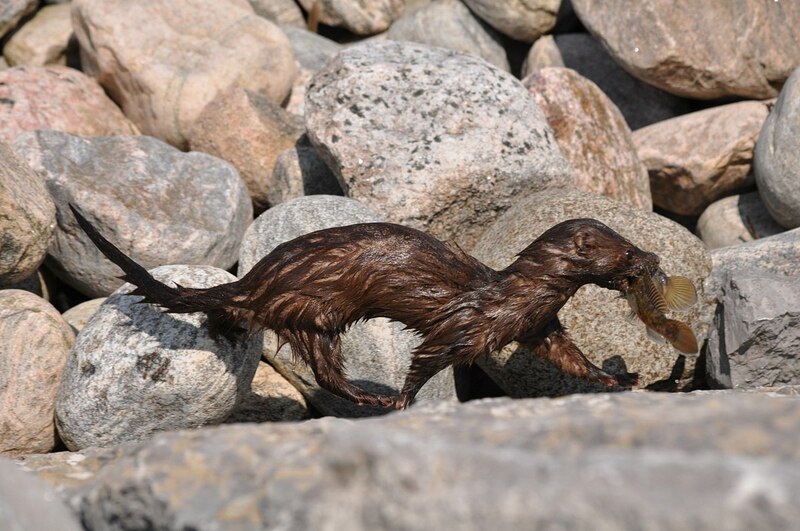 With the Mink’s wet fur pasted to its body, the long, lean and lanky figure stood out against the pale grey stones so its movement across the shoreline was fairly easy to monitor. The Mink’s tail makes up about one-third of its overall length. 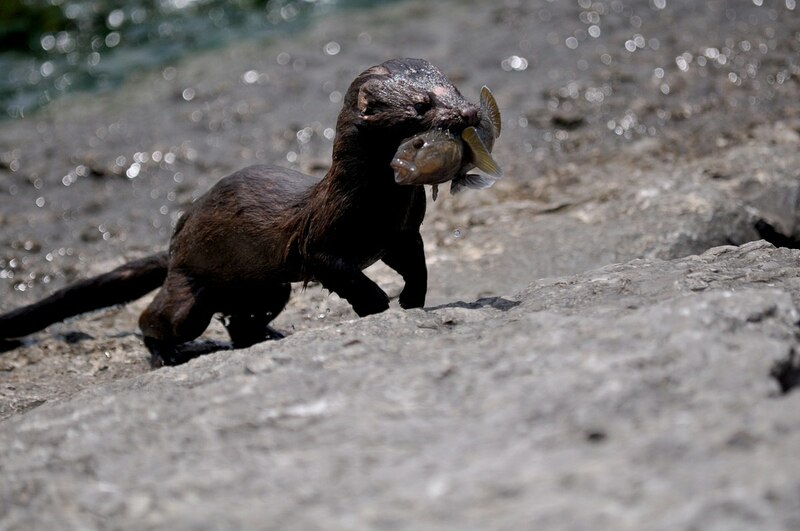 It is the slender body that enables a Mink to enter the burrows of its prey in other habitats where fish may not be as available. Bob and I were so excited to observe the no-nonsense work ethic of this busy little mammal. 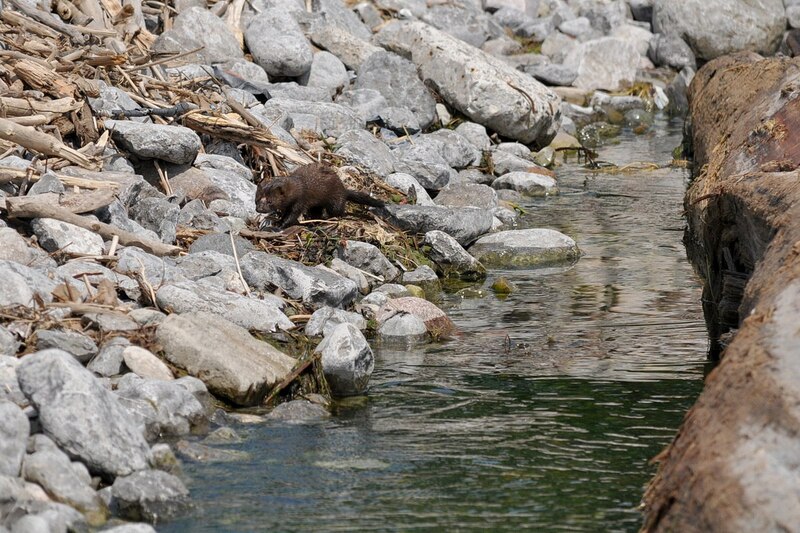 Even though its fur was saturated with water, I’m sure that the Mink’s constant activity helped to keep it warm despite a constant, brisk breeze that blew out of the west. Its dark brown coat of fur also would draw the heat of the sun which stood no chance of drying the soft, thick fur. Because Bob and I watched the Mink over the course of a half hour or so, we were able to discern the location of the den. We cautiously approached the location where we had seen the Mink drop out of sight. As it returned to the den with another fresh catch, its mate poked its head out into the light of day giving us a view of the white fur on the chin. The territories inhabited by Mink usual feature undisturbed, rocky coastal areas, but they are not particular when it comes to choosing a site for their den. 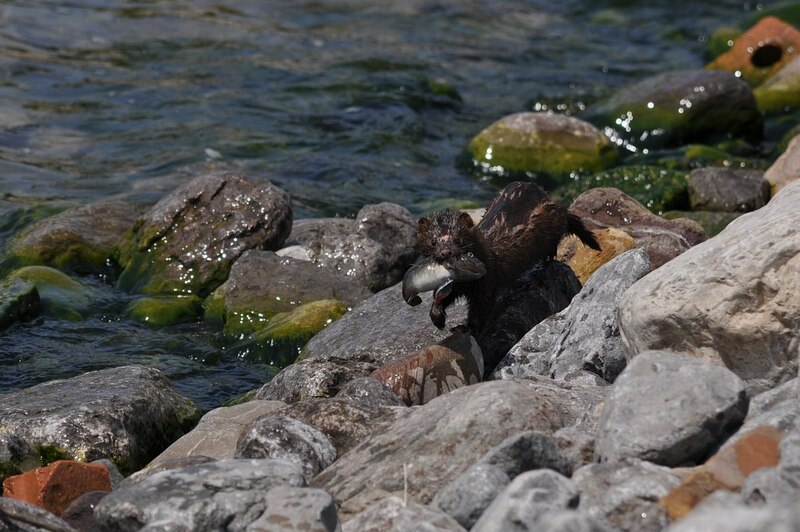 As long as they are in close proximity to water, any crevice or nook beneath a pile of rocks will do. 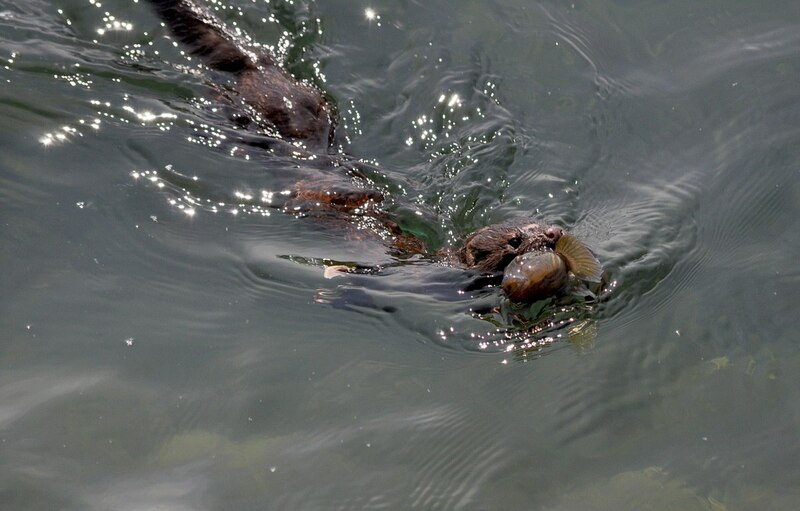 Although Bob and I had to abandon our bikes at the side of the Waterfront Trail, the stop was well worth the time it took to witness the comings and goings of this industrious Mink. We felt blessed to have been in the right place at the right time. these are fantastic…I love the pic of it’s little bum and feet. What strange looking fish to see coming out of the lake! So glad you enjoyed looking at our photos of the mink. We were surprised, too, to see such unusual looking fish being caught in Lake Ontario. Wonders never cease.